SUPER SOFT & WARM COMFORTABLE CORAL FLEECE FABRIC: The pet clothes is made of coral velvet, it feels very soft and comfortable, not shed hair, no fading. And this clothes has good warmth retention property and elasticity, which is very suitable for dog. 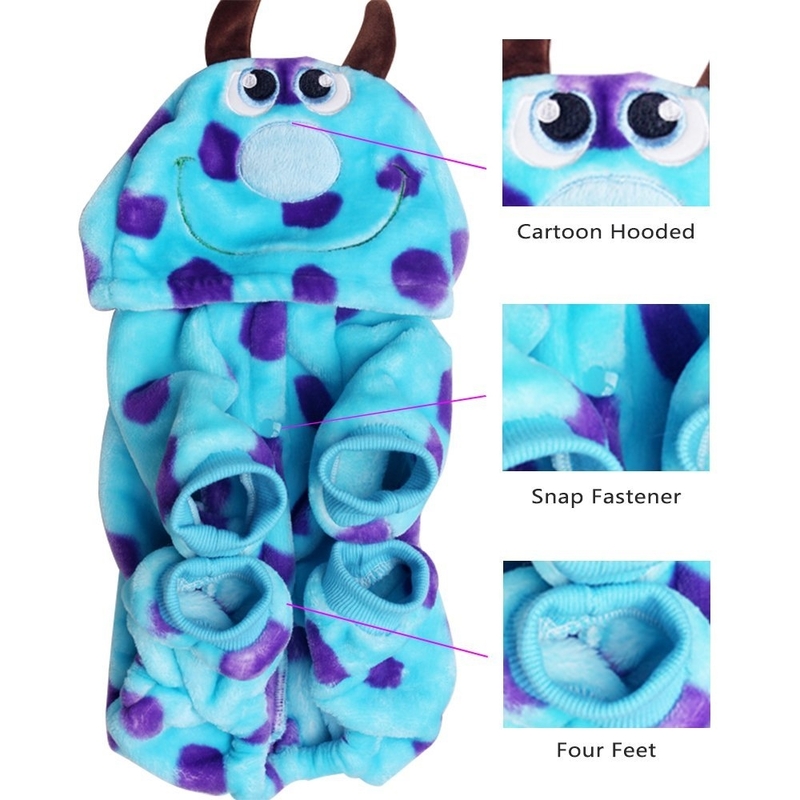 CUTE CARTOON HOODED DESIGN: This hooded design is cute cartoon characters, put on this clothes, which makes pet looks more cute and it can stands uo against the chill wind. There are a hole under the hat, you can easily fasten traction rope, conveniently take dog for a walk. How convenient! MORE WARM FOUR FEET PET CLOTHES: Your pet will be wrapped in the four feet clothes, and the clothes doesn't have air leakeage. What a nice warm pet clothes! EASY TO PUT ON & OFF SNAP FASTENER: This pet clothes with snap fasteners, convenient to your pet to put on or off the clothes. And reduce dog's hair fall to the ground with it, keep your home clear, protect the dogs hair clean in the outdoor playing. How Perfect! MEASURING SIZE: Measuring the clothing size is standard for the length of the dog back (Measure from below the neck, not including the tail). 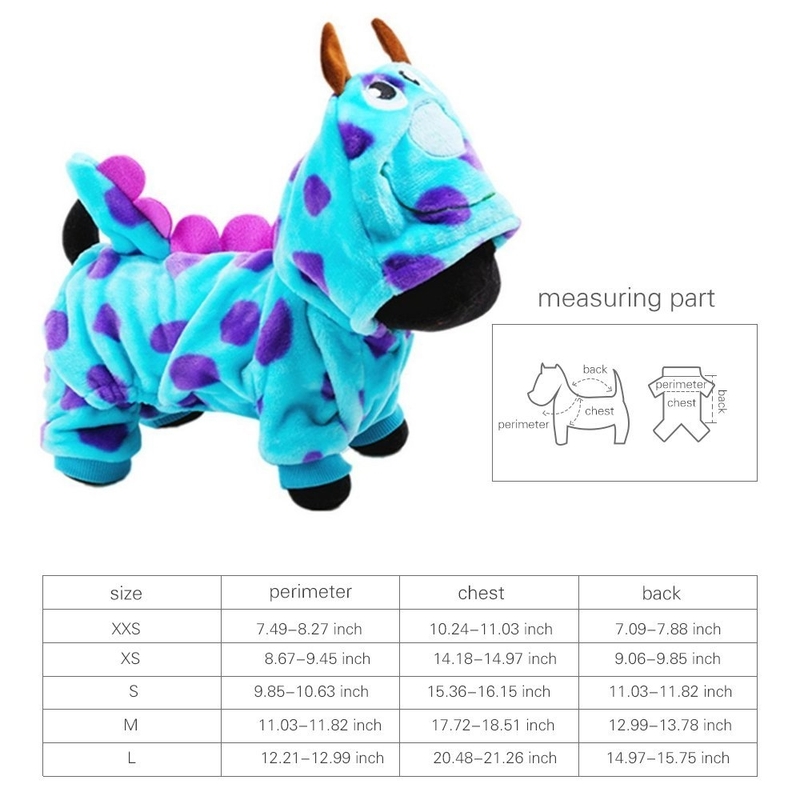 The clothes size is larger than the dog's actual size 1.2-1.9 inch.